 Mahogany, Seasom and Nimh wood Tabla shells are carved from trees and designed by relatives in Mukta's home village of Ranaghat Nadiya . Mukta receives these shells in various diameters; 5", 5.25", 5.34", 6" and 7". 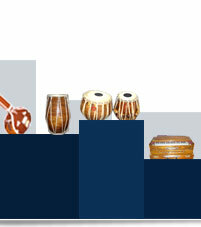 All diameters are equal to the depth of the hallowed interior and are of effect to the tune of the tabla. The standard height is 10.5" - 11".  Skin Preparation involves scraping the hide clean of fur as well thinning it out to the desired width. Mukta obtains hides directly from the Kalighat temple. Three layers of skin are measured and cut suited to the corresponding tabla and soaked in water for 30 minutes. The bottom layer is a ring made of cow hide. The middle layer is called the Shure meaning "open sound". 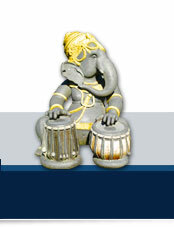 It is made of goat hide and is stretched fully over the width of the tabla. The third layer is once again a ring as well made from goat hide and called the khani.  A ring shaped rim is made of thick straps of cow hide bound with thinner strips of cow hide. It is decoratively woven with more thin lengths of goat hide. 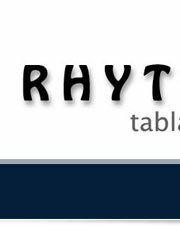  The three skin composition is placed atop the rim of the tabla. The ring shaped rim is fixed atop the skin. Now 16 evenly spaced lengths of camel hide straps entitled chhad hold fast the skin and tie to the bottom, as well as provide the means to which the tabla is tuned.  The Gab or Sinhai is applied to the "Shure" layer of the skin. The Gab is a paste comprised of iron fillings, cooked white rice and the water of soaking white rice. The paste is applied 8 times in separate layers each drying fully before the next layer is applied, taking the form of a horizontal half crescent. The gab of tabla is precisely centered.  Finally 8 wooden dowels entitled "Guile" are each strung under one length of the camel hide straps. 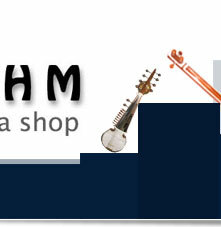 This increases tension of the skin and the final tune of the tabla is then fixed.  From relatives in Mukta's home village, Brass and Cover Bayan shells are hand crafted and decorated. Mukta uses 2.5 to 3.5 kg shells. 9.25" to 9.5" is the diameter. And the height varies from 10.5" to 11.5".  Skin Preparation involves scraping the hide clean of fur as well thinning it out to the desired width. Mukta obtains hides directly from the Kalighat temple. Three layers of skin are measured and cut suited to the corresponding bayan and soaked in water for 30 minutes. The bottom layer is a ring made of cow hide. The middle layer is called the Shure meaning "open sound". It is made of goat hide and is stretched fully over the width of the bayan. The third layer is once again a ring as well made from goat hide and called the khani. The skin of bayan can also be made leaving out the bottom ring layer thus comprising 2 layers.  The two or three skin composition is placed atop the rim of the bayan. The ring shaped rim is fixed atop the skin. Now 16 evenly spaced lengths of camel hide straps entitled chhad hold fast the skin and tie to a cotton woven ring at the bottom. Also giving means for the tuning system of bayan.  The Gab or Sinhai is applied to the "Shure" layer of the skin. The Gab is a paste comprised of iron fillings, cooked white rice and the water of soaking white rice. The paste is applied 8 times in separate layers each drying fully before the next layer is applied, taking the form of a horizontal half crescent. The gab of bayan is placed off-center.  Finally 8 wooden dowels entitled "Guile" are made. The guile of bayan is much thinner and also longer than that of tabla. The gulie is not immediately applied, but may be preferred by some individuals depending on preferences to skin tension and tuning.